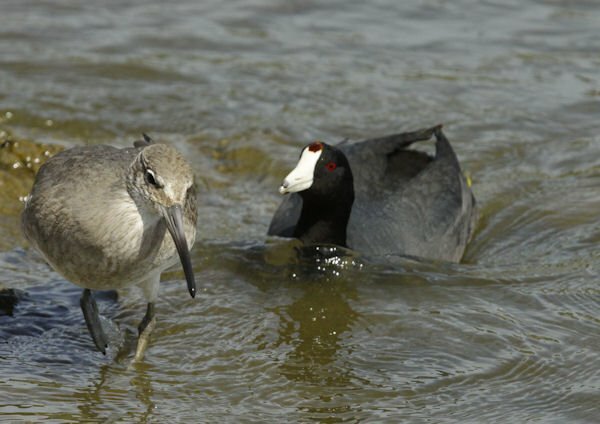 So, Floyd Mayweather might be the overwhelming favourite in a fight where Conor McGregor crosses disciplines to challenge him, but where would you put your money on the outcome of a confrontation between a Willet and an American Coot? I had not previously considered a situation where the two species might come into conflict, but I bet it would be a real money-spinner on pay-per-view. Mayweather and McGregor are expected to attract 5 million ppvs for their super-fight at the 20,000 seat, T-Mobile Arena in Las Vegas. Without the pre-fight build up and extravagant purse however, the audience for this low-card bout at Shoreline Lake, Palo Alto Baylands was a mere 1. 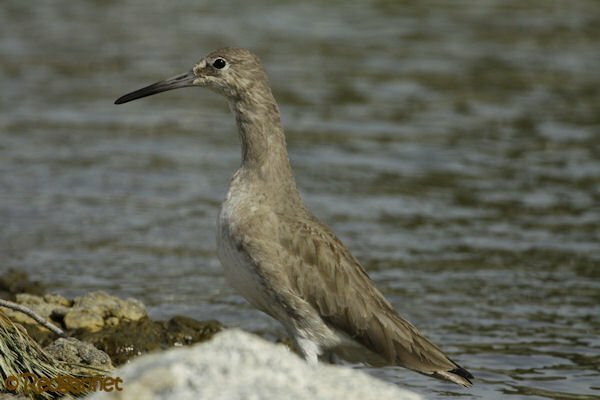 The Willet in question appeared to be going about its everyday business of probing and poking about at the water’s edge. The coot too, seemed to have nothing better to do than what it had done yesterday and the day before that and probably every other day of its life. 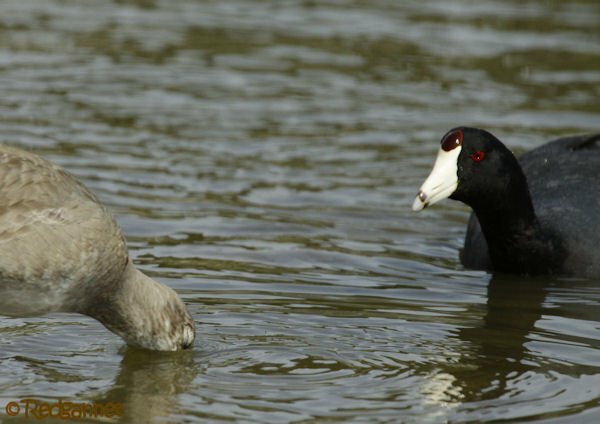 Suddenly however, the coot took offence at the probing, saw an opening and made a lunge for the Willet who leapt out of the way, looking back somewhat startled at the turn of events. Satisfied that its point had been articulately made, the coot returned to doing whatever it is that coots do. Actually, a lot of a coot’s time is taken up with bickering amongst its own species, but both the Willet and I were at a loss to see what had made the coot pick on something that had a much better reach. 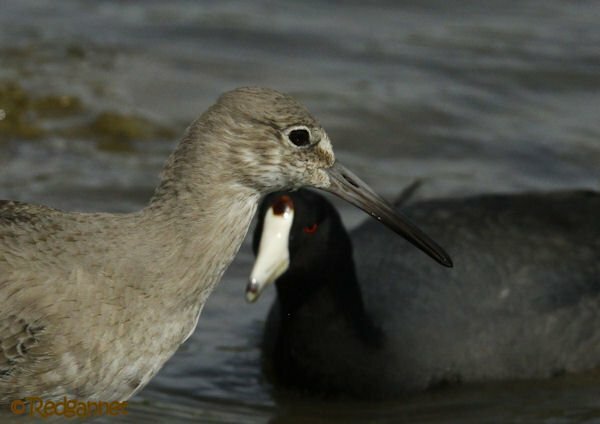 I dare say a jab from the Willet might quickly have put an end to the bout, but it had adopted a passive strategy and taken a points defeat in this round. 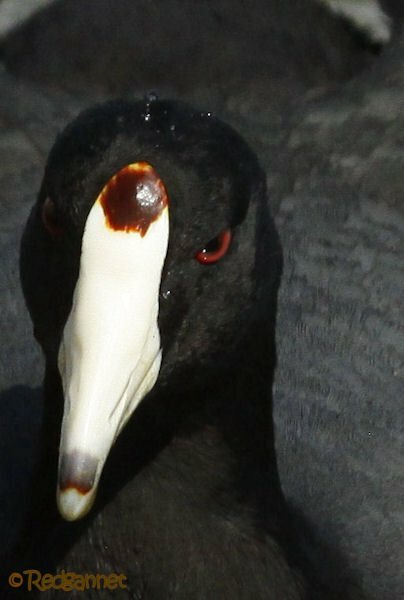 So often in the natural world, the sight of a soft underbelly is taken as a victory and life goes on with the pecking order firmly established, but this coot was belligerent and had a mean look in its eye of devil red. It pretended not to notice as the Willet returned to the water’s edge, but slowly closed the gap between them with evil intent. Once it was close enough it charged again, this time the Willet had anticipated an attack, but still chose to move out of range by skipping up onto the rocks. 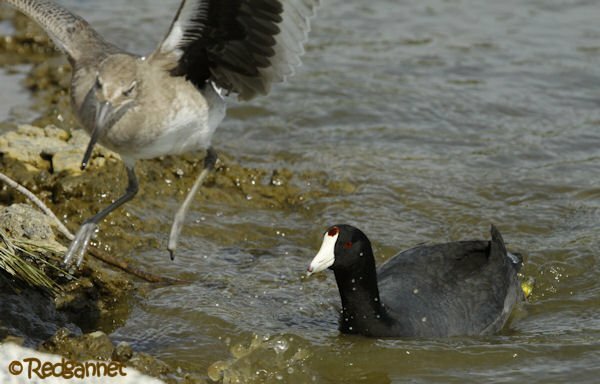 So American, “Assassin” Coot beats “Wobbly” Willet by a technical run away. Perhaps the coot had a nest nearby, though one was not obvious along a bare shoreline. 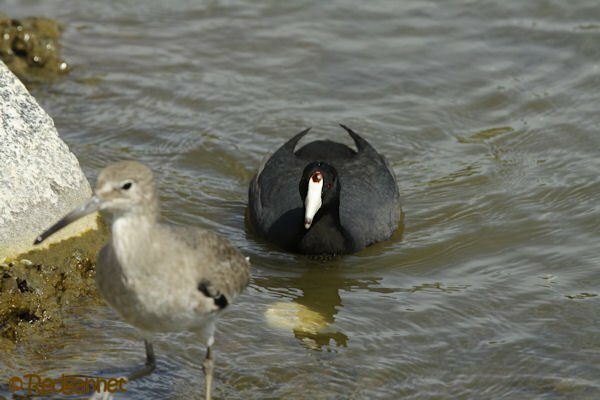 Eurasian Coots are certainly known to be pugnacious and always up for a scrap. 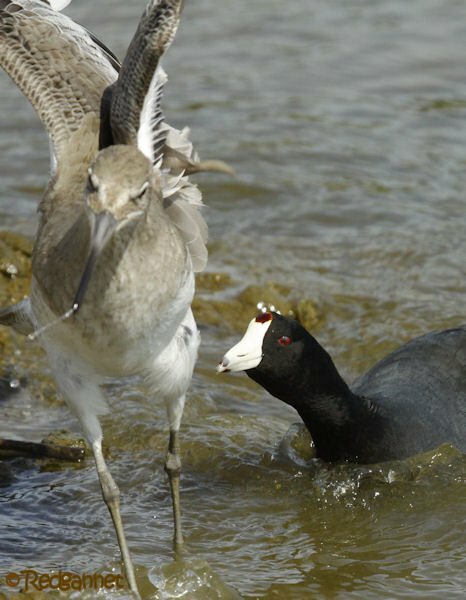 I guess American Coots have the same aggressive tendencies. I would have wagered that the Willet would have outreached the heavier coot, but would have lost the bet. The plucky underdog is always the British favourite though I do worry about Conor McGregor’s Western Palearctic complexion in the Nevada desert. There was never a doubt about the outcome. Coots always win. Ever wondered why Orcas never colonized freshwater areas? Coots. Yeah, the coot has to be at least a 100-1 favorite here. I wonder which coot species is the toughest in the world? Talk about something I would pay to see on pay-per-view!